left to right: JRH Noble (co-presenter), Desmond B Kennedy, Air Chief Marshall FR Miller (presenter). left to right: A/C GG Ruttan, A/M CL Annis, JRH Noble, Desmond B Kennedy, A/C/M FR Miller, Lt/Gen JV Allard, R/Adm RP Welland. D.B. ("Des") Kennedy, head of the Meteorology and Oceanography Section at Canadian Forces Headquarters in Ottawa was awarded the Patterson Medal for distinguished service to meteorology in Canada. Presentation of the medal was made by Air Chief Marshal F.R. 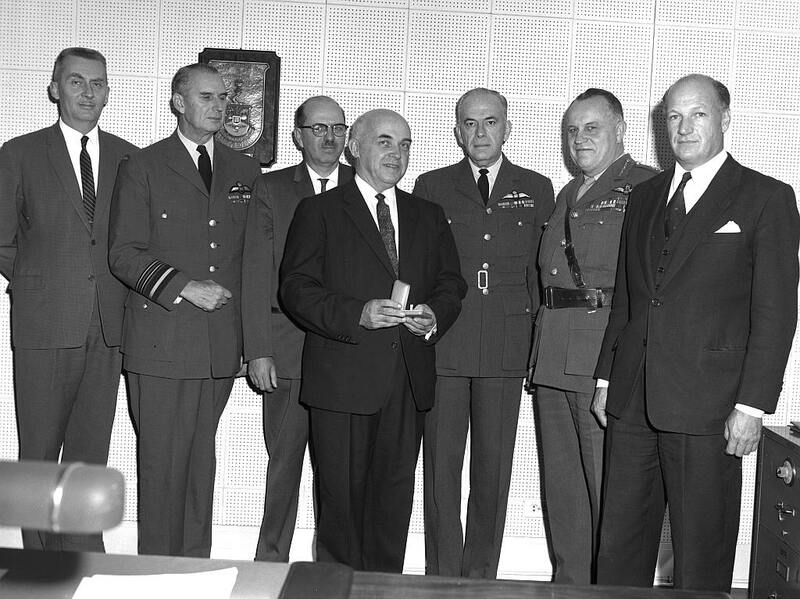 Miller, Chief of the Defence Staff, at a brief ceremony at Canadian Forces Headquarters on November 4, 1964. 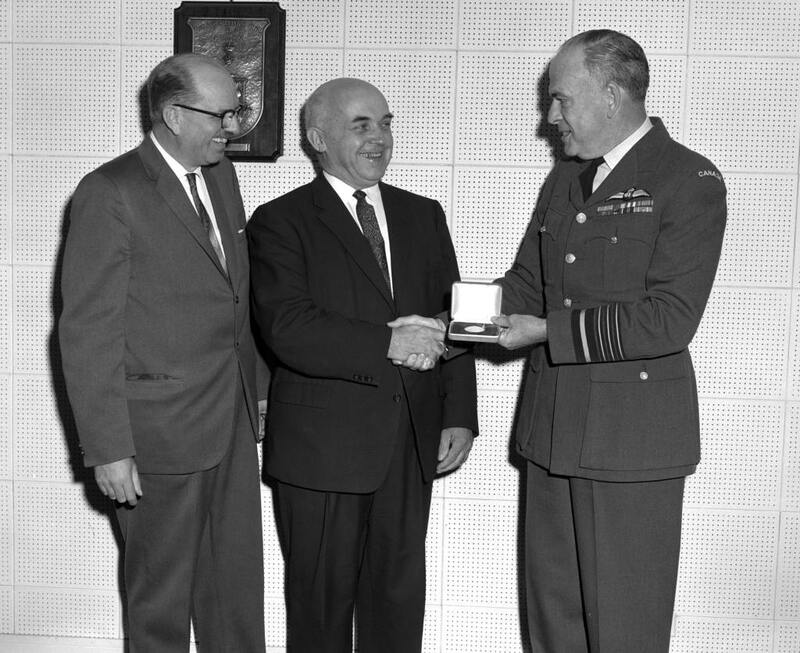 The Patterson Medal honours a former Director of the Meteorological Service of Canada and is given for a unique outstanding achievement or for sustained contributions over several years to any resident of Canada. Mr. Kennedy has been actively engaged in the organization of meteorological support for the Canadian Armed Forces since early in world War II. During the war years he pioneered meteorological instruction for wartime aircrew, was in charge of the intensive training program to provide meteorological officers for the British Commonwealth Air Training Plan and later was engaged in administration of the Meteorological Offices at the wartime air stations across Canada. In 1946, he was awarded the MBE in recognition of these wartime activities. Shortly after the war he was appointed to the position of Meteorological Adviser at AF HQ and subsequently served as Liaison Meteorologist and as Meteorological Adviser to the Chairman Chiefs of Staff. Mr. Kennedy has been a major contributor to the development of an efficient military meteorological organization. The citation accompanying the award to Mr. Kennedy noted that he had "distinguished himself as an interpreter between the civil and military interests in meteorological matters".